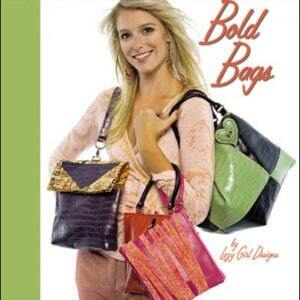 The 7 bag designs in this book are made using faux leather and mock crocodile. The projects range from easy to intermediate. 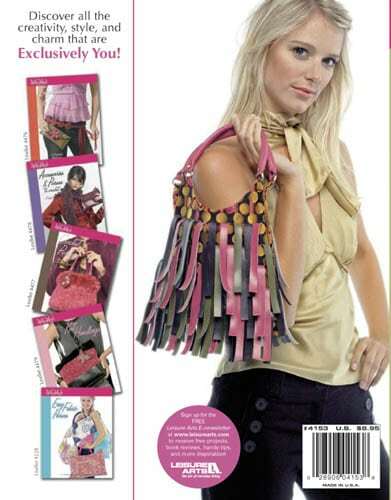 Suggested Retail: $8.95 Item #4153 7 Bag patterns 32 pages, full-color. Five of the seven bag designs are shown on the front and back covers of the book. ‘Sling’ bag – Purple, one-strap backpack to the left on the front cover. ‘Mod’ bag – Tan with black handle and a zipper, front cover. ‘Wristlet’ – Pink with embellishment, front cover. An easy introduction to working with the Exclusively You products. ‘Bucket’ tote – Green and black, it finishes to a 10″ cube! 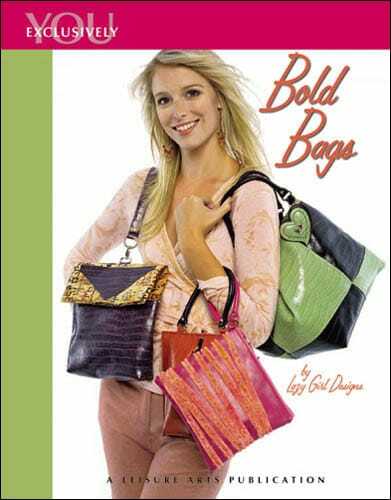 Not shown on the cover: ‘Tote’ bag – A large tote with two shoulder straps. ‘Cup of Coffee’ – A fun, zipped bag, shaped like a cup of coffee.